@f5ive: Thank you. The track is 'D Pulse' by Kivema. Hello and welcome to the show. Thanks for joining us. We are starting on a funky vibe with the Alex Preston remix of 'Let's Start the Dance' by Beni. Let's get this show rollin'. It's rollin'!!!! Now it's time for this week's guest mix. Making her debut on the show, please welcome Tonia Nee!!! We review some of the music played in this week's show and discuss another important subject. Now it's back to Tonia Nee's guest mix for the final three minutes of the show. That's all we have time for this week. 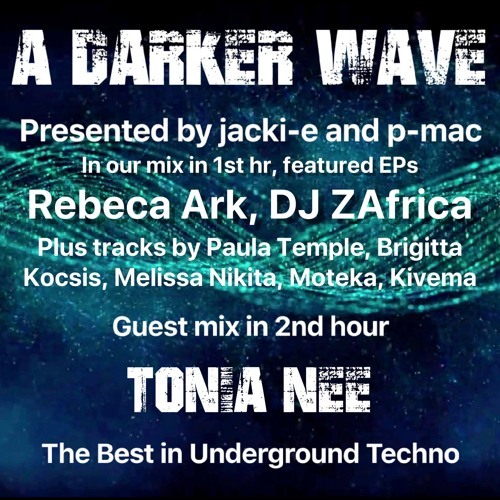 Thanks to Tonia Nee for a brilliant guest mix and thanks also to you for listening. See you next week, same time, same place! !